A beautiful, moving tale of one sister's tribute to her brother -- and the everyday heroes who work to rescue the animals that sustain our soldiers' spirits. Growing up in the well-heeled Detroit suburb of Grosse Pointe, Michigan, Carey Neesley always thought she and her younger brother, Peter, would never be separated. The children of divorced parents and outcasts in their neighborhood, Carey and Peter supported, loved, and encouraged each other when it seemed no one else cared. It was a bond that grew through the years, and one that made Peter's eventual decision to enlist in the Army all the more difficult for Carey. With Peter having stepped up to help her raise her young son, Carey was closer than ever to her brother, and the thought of him serving far from home was painful. While stationed in Iraq, Peter befriended a stray dog and her four puppies, only to watch three of the young pups die in the warzone. 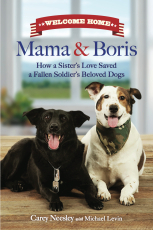 With only two surviving dogs -- Mama and Boris -- Peter became determined to save the strays. Carey helped her brother with his mission, but everything changed on Christmas Day in 2007 when word arrived at the Neesley household that Peter had been killed. Amidst the grief of coming to terms with her brother's death and the turmoil of trying to plan his funeral, Carey devoted herself to bringing Peter's dogs home to the U.S. It was the final honor she could pay to her brother and a way of keeping a piece of him with her. With the help of an unlikely network of heroes, including an animal rescue organization in Utah, a civilian airline, an Iraqi family, and a private security contractor with military connections, Mama and Boris mad the journey form the streets of Baghdad to Carey's suburban house. Carey's mission garnered widespread attention and requests from other soldiers for help in bringing home dogs they had become attached to on deployment, and she continues to work with organizations dedicated to bringing home wartime strays.